Anne Benjamin’s book opens with a wedding between unlikely lovers: an Indian-born development worker and a Catholic academic from Sydney who left the predictability of life in Australia to live in the South Indian city of Chennai. 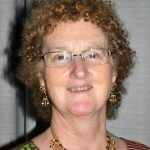 Anne Benjamin is a Sydney-based writer, poet and educator. Her work in India included programs focused on women and their development. Anne will share some of her experiences living and working in India during a tumultuous period in its history.